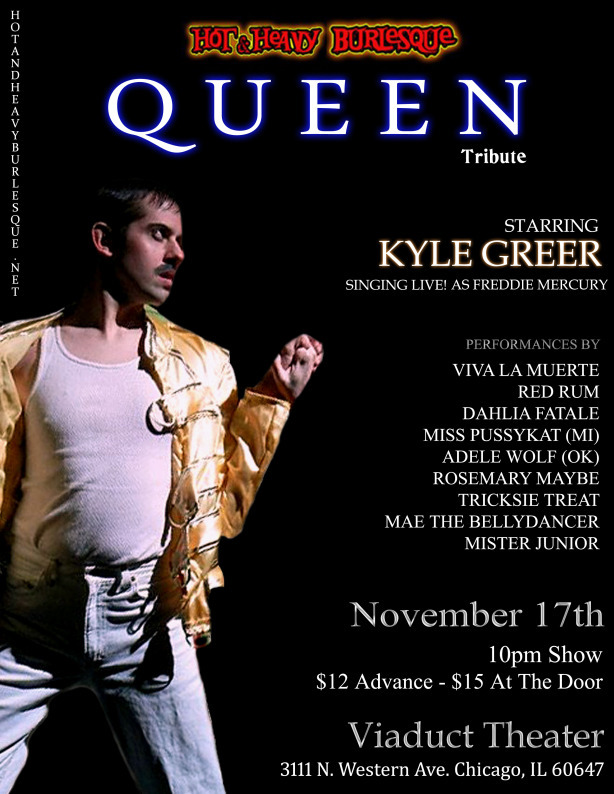 This Saturday, November 17 the Burlesque Tribute To QUEEN: Starring Kyle Greer As Freddie Mercury will be presented by Hot & Heavy Burlesque at The Viaduct Theater in Chicago, Illinois. For nearly four years Hot & Heavy Burlesque has been bringing neo-burlesque to Chicago audiences that “embraces the extreme & places particular importance on the music” with amazing, unique and theatrical productions. Burlesque Tribute To QUEEN promises to keep their tradition of amazing shows going. 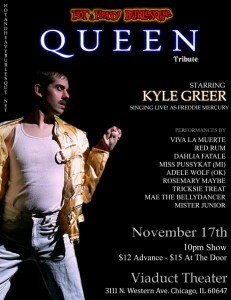 The entire show will be sung live by Kyle Greer as Freddie Mercury and feature performers from around Chicago and beyond! Come and be treated to performances by Viva La Muerte, Red Rum, Dahlia Fatale, Rosemary Maybe, Tricksie Treat, Mae the Bellydancer, Mister Junior and Sauda Namir. There will also be special performances by Miss Pussykat, Barbacoa Jones and Oklahoma City-based Brown Paper Tickets producer/performer Adele Wolf! Tags: Adele Wolf, Aspen Fire, Barbacoa Jones, burlesque, Chakra Tease, Cherry Pop Pop Poppins, Cora Vette.